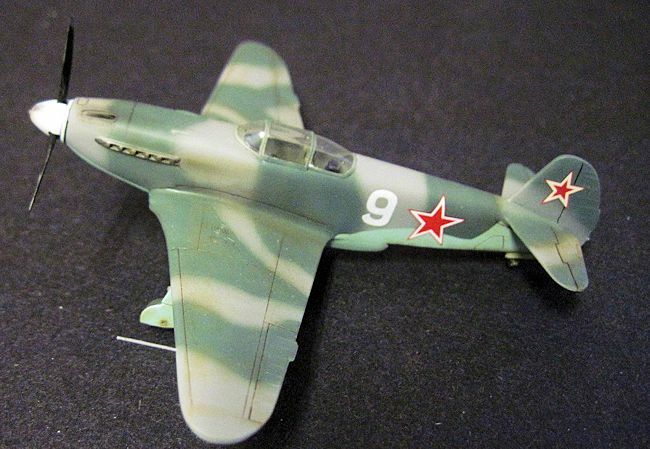 Much has been written about the Yak-3. 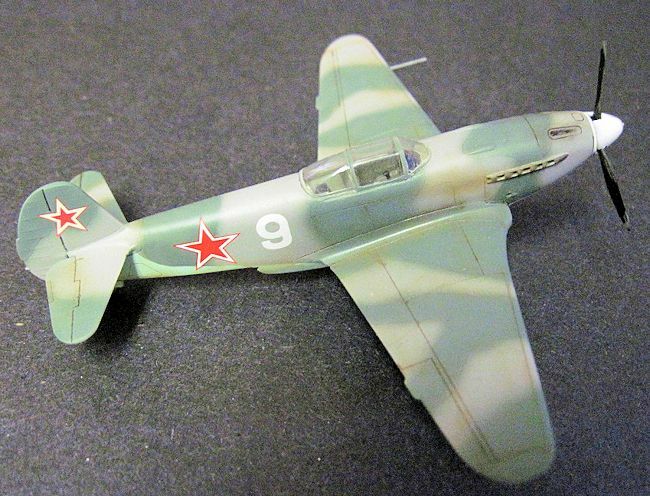 It was a lightweight, small fighter built by the Soviets in WW2. It was a further development of the Yak-1M series with a shortened wingspan and other improvements. The idea was to improve the already existing Yak-1M series by focusing on improving its endurance, combat ability and firepower. It was crucial that in order to improve its abilities, great steps would have to be made in weight reduction and increasing its performance and speed. The prototype Yak 3 started life as a standard Yak-1M fuselage fitted with a new shorter span redesigned wing. The designers at Yakovlev were hoping to install the new M-107 engine with its increased 1,500 plus horsepower engine. Though highly anticipated the new engine never really materialized so they had to keep the M-105PF engine already in use with the Yak-1 series. The P meaning "pushka" or cannon (in this case a 20mm model) which was mounted between the cylinder banks and fired through the propeller hub. Improvements were made to the airframe to make it more aerodynamic like a reconfigured oil cooler intake and a one piece wraparound windscreen to improve forward/all around visibility. Trials for the prototypes started in early 1943 and it did not disappoint. Top speeds between 410-422 mph had exceeded expectations greatly and its flight performance at lower altitudes was excellent. Unfortunately the prototype crashed from structural failure during one of the trials (I'm assuming the pilot was probably killed) and delayed full State Acceptance until October 1943. However the demand from pilots in the field for a more modern and efficient fighter led to them being introduced into fighter service before completion of State Acceptance. 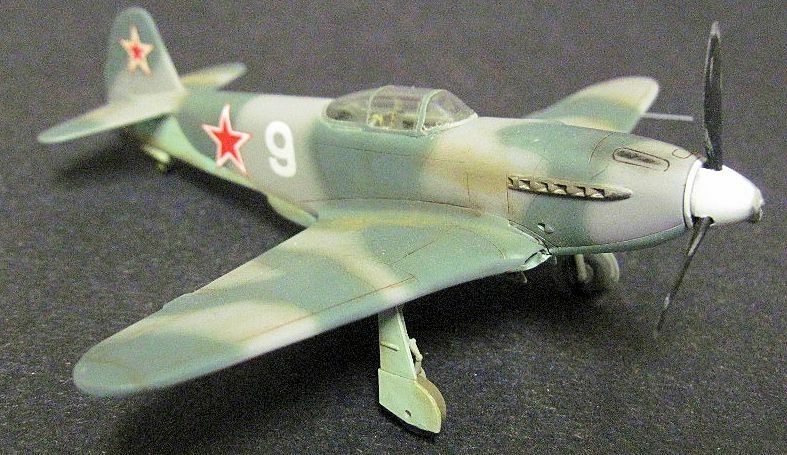 Yak-3s first saw action in June 1943 towards the end of Operation Zitadelle in the Kursk area. It was a fighter that was loved by its pilots and could easily hold its own against its Luftwaffe contemporaries like the Messerschmitt BF109 F/G series and Focke Wulf FW190. One of the lightest fighters of the war due to its mostly wood construction, it weighed in at around 5,864 pounds. The Yak-3 had a range of just over 550 miles, a top speed of around 404 mph and most of them were fitted with a single 20mm ShVak cannon and two 12.7mm Berezin machine guns. Many an ace would claim their fare share of kills and came as a nasty surprise to unsuspecting Luftwaffe pilots. Hasegawa's kit has been around for sometime. It is a very nice model in typical Hasegawa fashion. There are three sprues molded in Hasegawa's standard light gray plastic and one in clear for the canopies. 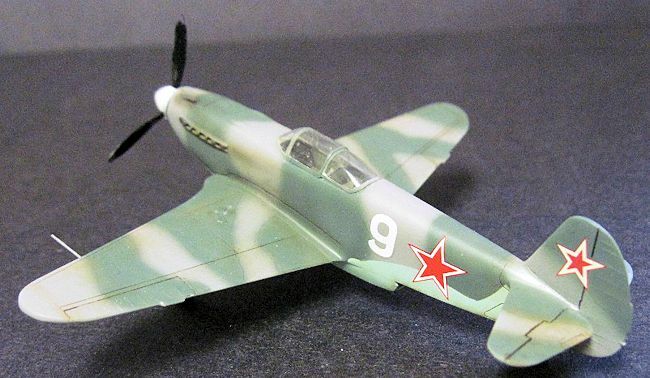 Since the Yak-3 was of mostly wood construction there aren't a lot of panel lines on the kit. The ones that are there though are finely engraved. There are just a few on the fuselage halves and most of them are on the wings. In typical Hasegawa fashion the panel lines are just right, not too fine and not too deep. Wheel wells are unfortunately not boxed in. Don't know how much this might bother some but it wouldn't be too hard to fix. The cockpit is almost ample enough with a one piece main unit that consists of the floor, lower seat bottom, consoles and foot pedals. There is a separate seat back, instrument panel and control column. A decal is provided for the instrument panel which itself is flat with no molded in raised detail. As usual in a 1:72 scale Hasegawa warbird kit there is no sidewall detail on the inner sides of the fuselage halves. A nice touch is the option of two canopies to choose from. One is a solid single piece unit while the other is a separate three piece affair for anyone wishing to pose it open. Decals are provided for two Normandie Niemen aircraft. One for Pilot officer Robert Marchi and the other for Pilot Officer Roger Sauvage. Sauvage had the distinction of not only being a gifted fighter pilot but also because he was African American. He was born in Paris in 1917 and flew with the Armee de l'Air then eventually with the Normandie Niemen for the Soviets. But that is another story in itself and one well worth reading! Construction started in the cockpit. If you're doing this kit out of the box, it won't take you long to finish the cockpit that's for sure. To start with I glued the control column to the floor and the back of the seat in place. While I was at it I glued the radio platform panel to one of the fuselage halves before setting everything off to the side to dry for a day or two. Not sure what the exact color was for the cockpit I just followed the instructions and used Gunze H48 Field Gray. This color is not unlike RLM02, just maybe a little darker. I used it for the entire cockpit, instrument panel, insides of the fuselage halves and the insides of the landing gear doors and wheel wells. Since the paint was a gloss color I didn't have to use a separate clear gloss before applying the instrument panel decal. Once the paint was dry I simply applied the said decal right over the top of it and voila that was that! I did spray some Testors Dullcote it to seal the decal in once it was dry though. Any other details that could be picked out in the cockpit were also done at this time. This was mostly just some flat black for the control column grip and for the radio box behind the pilot. It was at this point that I hit my first snag with the build. 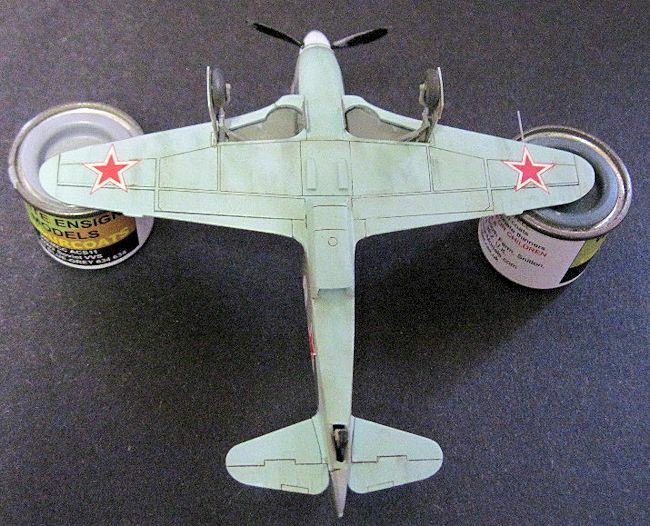 The Yak-3 features two front air inlets at the wing roots (one on either side of the fuselage at the wing root joint). In the middle of each of these oval shaped air inlets is a vertical "splitter" bar. I don't know how this is done on larger scale Yak-3s but on this kit this "splitter" as we'll call it is, well, split into two pieces. One is on the inside of the top wing and the other is on the inside of the bottom wing. The wings themselves are different from the more common 3 piece affair with the single lower span and the usual two single individual upper pieces like you'd see on a Spitfire, Mustang, BF-109 etc. Instead this kit features a single span lower piece and a similar single piece for the upper wings. Maybe it's a common feature on Yak-3 kits of all types? Anyway, when you go to line up the two wing halves with each other, everything fits nice except for the said splitter plates. They don't line up with each other. After much deliberation, I cut them out from both main wing sections and replicated them with some thin sheet styrene. It was easier than I thought and a feather in the cap so to speak! Once this was done I glued the wing halves together and set them aside to dry. Around this time I worked on cleaning up the fuselage seams. Due to the unusual configuration of the wings, the cockpit floor rests in a rectangular hole in the top of the one piece upper wing. A test fit of dropping the fuselage assembly down onto the wing showed a positive fit. So the cockpit tub was glued in place and the fuselage was then glued to the wing assembly. The horizontal stabs soon followed and I now had a mostly complete airframe. You'd think for something as small as a 1:72 scale Yak that this could be a quick and easy project. For some that would be the case but not for me! when I went to add the radiator/bath piece I hit another snag. I don't know if it was me or the kit but the trailing edges of this unit that make contact with the fuselage had a big gap on either side and did not sit well at all. With no quick or easy solutions I added some sheet styrene on either side of the piece (again to the two sides that make contact with the lower fuselage) and ended up trimming and sanding the "extensions" I added until I got them to square up against the fuselage. Before gluing this part to the fuselage I painted the interior walls of it and the relative area of the fuselage with some AMT7 Blue from White Ensign Models. The separate "door" at the rear of the assembly was added and I had previously painted the inside of it with the same color. Eventually things started to take shape. Now with all the seams cleaned up and filled, the wheel wells were masked off and the airframe was almost ready for paint. The canopy was masked with some bare metal foil and glued in place. For this model I used White Ensign Model paints. For the bottom of the airframe and outsides of the landing gear doors I used their AMT7 (light) Blue. This color went on quite nicely I must admit. Once this color had dried the bottom of the airplane was masked off in preparation for the AMT-11 Blue Grey. This color also went on nicely and without any problems. The last color to go on was the AMT-12 Dark Grey. I thought this color was originally going to be a dark grey but was surprised to see it was a very dark sort of greenish color. I don't know why but for some reason this color didn't go on as well as the other two. Even though it was thinned to the same consistency as the first two, it just didn't perform as well and was kind of blotchy and a little on the watery side. It may have just been a faulty operator valve and I'll try and be more careful next time. In the end everything worked out fine and you couldn't tell I had any problems so that was good. With the AMT-12 now dry and all the masking removed, the model was given a couple of coats of Future in preparation for the decals. With the exception of the national insignia I decided to eschew the rest of the kit decals and not do one of the Normandie Niemen planes. It's not that I have anything against the Nornandie Niemen aircraft it's just that they seem to be pretty commonplace when it comes to Yak-3s. Okay another reason too was because I "wimped out" and did not feel like trying to paint those red, white and blue stripes on that tiny spinner as well! 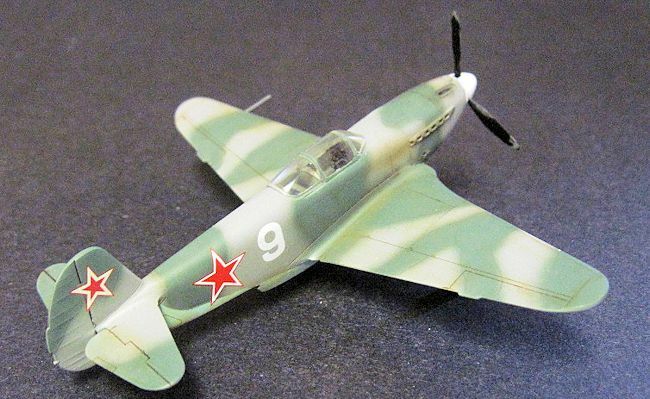 I decided to go with "White 9", a Yak-3 that was flown by Djilos Moritsov of the 419IAP in 1944. This plane was a little more unusual for it featured a white tactical number on the fuselage and a white spinner. After the decals were sealed in with another coat of Future the model was given an oil paint wash to dirty it up a bit and highlight some of the recessed detail. With the model nearing completion, the landing gear units were cleaned up, painted and assembled. I had previously painted them with the Gunze H48 Field Gray. All that was left was to paint the sliding sections of the oleos with some Model Master Chrome Silver enamel and a lightened flat black for the tires. All of these pieces and the gear doors presented no real problems and went on well enough. The pitot tube had also been previously painted and could now be added. The propeller had been previously painted with flat black. It and the spinner assembly were glued together. The exhausts were painted at this time too. One of the last things I did was to push on the completed prop and spinner assembly. To complete the model some weathering was done, using some various colored pastels to simulate dried mud and some gun staining. With that the model was now complete. It really felt good to finish this kit for a couple of reasons. For one I overcame the small hurdles that it threw at me. I also was quite pleased with how it turned out and have an appreciation for this little "mini mite" fighter. It really is a small airplane! It has pleasing lines and looks like a little racehorse. And most of all I was happy to complete this kit for it was the very "first" model I bought upon getting back into the hobby over a dozen years ago in 2002. Man where does the time go to!? When this kit was originally released it was the most modern version available in this scale. Previously there had been the old Heller kit which was also reissued by Airfix. One or two other examples existed but the Hasegawa kit was about the best one to be had if you were looking for one that was up to date and modern. Overall it is a nice kit that I can recommend. It looks nice in the box and for the most part goes together well. The kit is not without a couple of faults though. The lack of more interior detail doesn't help and the panel lines on the upper wings are supposedly "too much" since the real airplane had wooden wings. The shape of the spinner is also said to be a bit off. Despite these things it still looks like a Yak-3 to me. If it looks like a Yak and quacks like a Yak then it must be a Yak! Anyway that's enough yakking....:-) But at the end of the day I have no real gripes about the kit other than the high price it can command if bought new, either singly or in the more recent combo/twin pack which is not cheap! Now this kit has competition from the Hobby Boss kit and the most recent Zvezda kit. 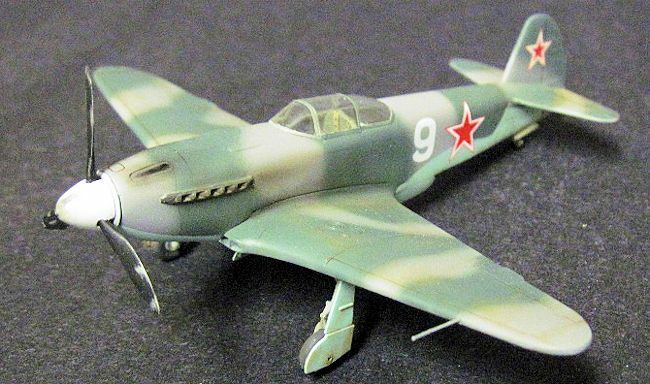 I would rate the Hasegawa kit better than the Hobby Boss kit but if you're looking for the top dog Yak-3 in this scale I would say then get the Zvezda kit for it has the most detail and is the most modern up to date kit. Thanks to for the review kit. You can find this one at your favorite hobby shop or on-line retailer.